Toddler Approved! : Kindergarten Will Be a Blast Rocket Party! 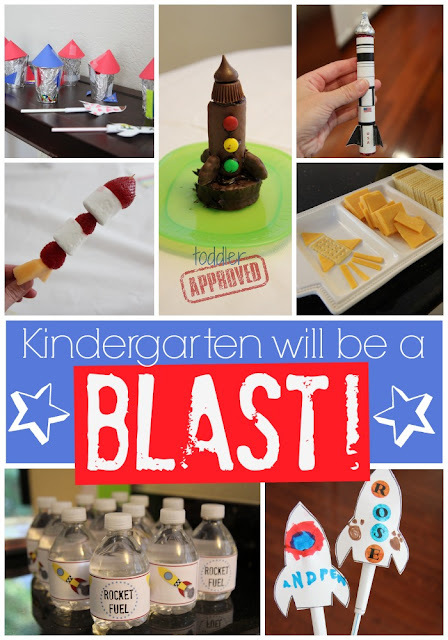 Kindergarten Will Be a Blast Rocket Party! My son is starting kindergarten today. I can't believe it. All summer long we worked to help him get ready for Kindergarten through play and now the time is here! Over the weekend I threw a little back to school party for some of his neighborhood and church friends that will also be starting kindergarten. I wasn't planning to post about it, but it turned out better than I expected, so I thought I would. Our "Kindergarten will be a Blast!" Rocket party was pulled together in less than two days with help from some awesome blogs that I also want to share with you! You can also check out my rocket board on Pinterest for more inspiration. 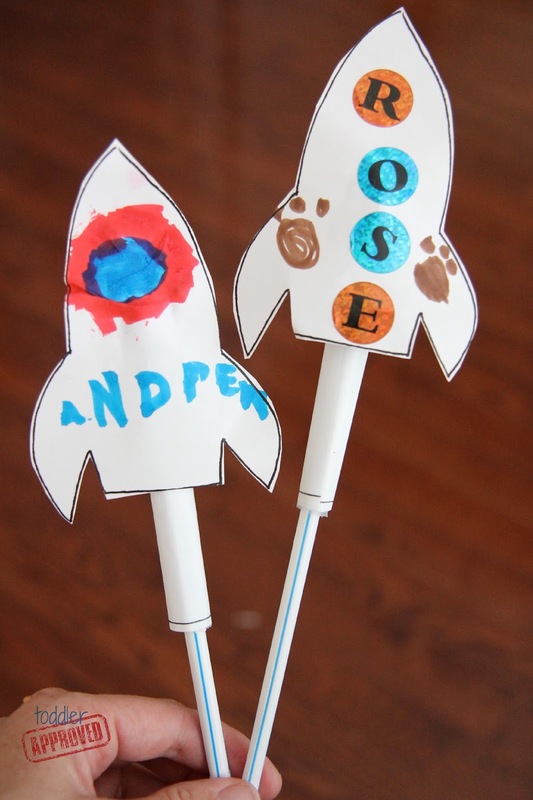 My goals for this kindergarten rocket party were to keep it simple, affordable, and fun! I wanted the kids to enjoy spending time together while creating, exploring, and playing! I wanted to enjoy it too... which is why I kept it low stress. We did two rocket crafts in between bouncing in the rocket bounce house and eating snacks. First we made Straw Rockets using the instructions and free template shared by Teach Beside Me. I prepped the materials ahead of time and the kids decorated their rockets with stickers and markers. Next we made Rocket Treat Cups based on inspiration from Phoodie's Out of this World Space party. I wrapped paper cups in foil ahead of time and pre-made cones and fins using colored cardstock. The kids each got their own roll of tape and added their fins and other embellishments- stickers, colored tape, etc. Then they got to go and fill their cups with candy treats... so of course this activity was a big hit! In between crafts and running around, the kids had some snacks and treats. We made fruit rockets inspired by Taste.com. 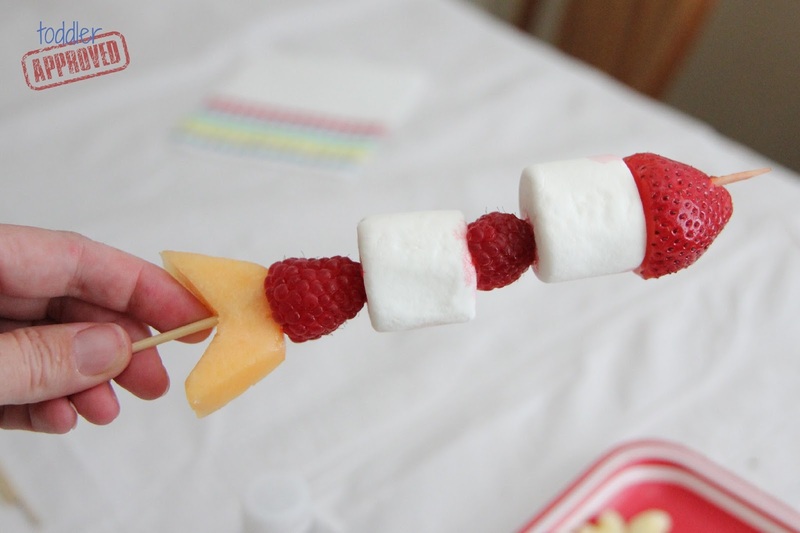 A few moms brought fruit and marshmallows and the kids got to pick and choose what to add to their kabobs. The kids also made cheese and cracker rockets. They were excited about each getting their own plastic knives to use. 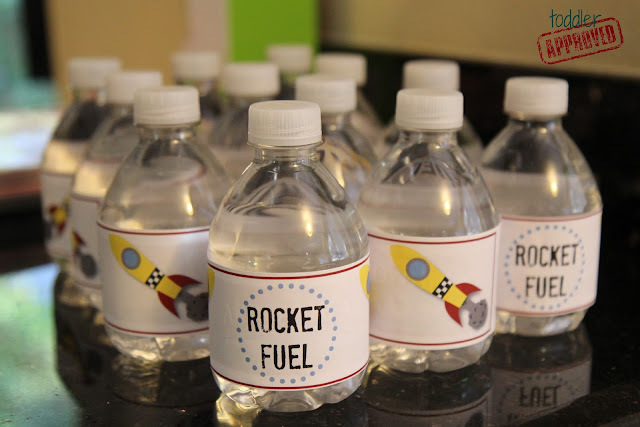 I also made some water bottle Rocket Fuel for the kids to drink. We planned to make these chocolate rockets from Hostess with the Mostess, but we ran out of time... so we made them the next night as a family. 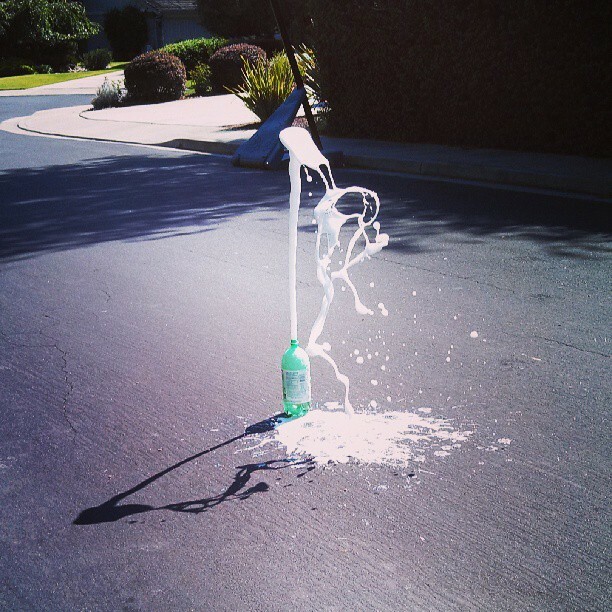 We dropped between 1-4 mentos into 2 liter bottles of sodas and the kids had so much fun predicting which would explode higher, what would happen, etc. I didn't manage to get any photos during the party... but this was basically what it looked like. Some of the kids had never done this before and were freaking out. It was so cute to see them so excited. 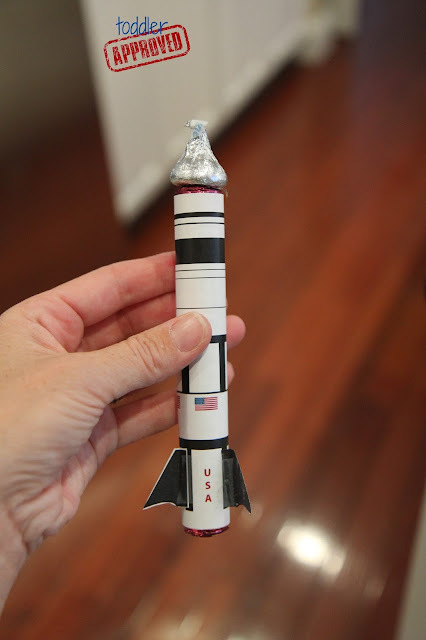 As the kids left we passed out some little mentos rocket party favors that we made using the free rocket treat printable from The Craft Nest. My kids have been blasting the leftovers into their mouths anytime I am not looking ever since Saturday. I had so much fun throwing this party for my kindergartener with help from some other wonderful moms! We had such a great time seeing how excited these kids are for this new transition! If you want to see more back to school party ideas, check out the "Kindergarten is FIN tastic" Party that EJ & Mommy and Me Book Club hosted last year! 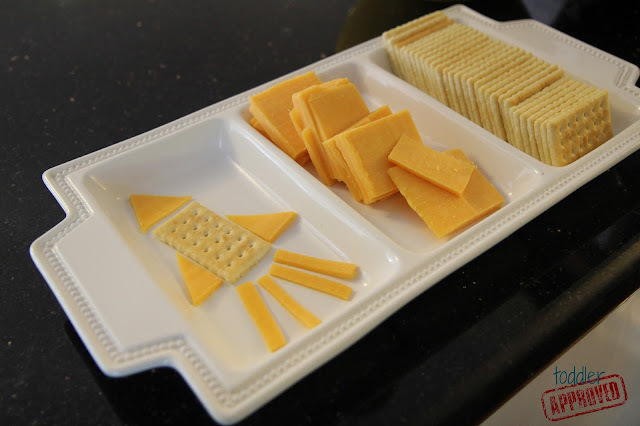 Have you ever thrown a Back to School party for your kids? Have you ever totally pulled one off at the last second like I did? If you were to throw a themed back to school party for your kids, what would the theme be? What a fun way to kick off the school year! I hope your son has a great first day!! This is just a wonderful way to launch a school year off! Thank you for your added tip on my post. I think it is important! 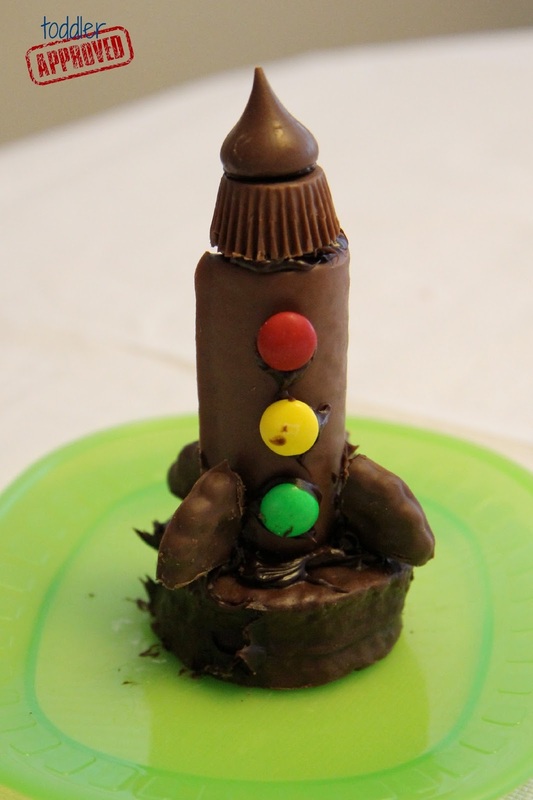 What a great party - love all your rocket snacks! I love this idea--it's such a great way to celebrate a new year! I'm pinning it!